Our students became ambassadors of the United States and proudly wore the American flag on the left shoulder of their uniforms. As ambassadors, they exchanged gifts with the host teams after every contest. The bottom line is that they all represented the USA with class and dignity and our community should be very proud! For 14-days, our kids were treated like rock stars, as they were the hit of Costa Rica. The “Ticos” have a national saying, “Pura Vida” or Pure Life in English. This basically means that life is good, no worries. The Costa Rican hospitality is second to none. Our kids did really well in their second International Basketball competition. Our boys’ 11-under went 4-1; our girls’ 13-under went 3-2; and our co-ed 7-under team went 4-1. This was the first time several of our students flew in an airplane, let alone been out of the country (3,657 miles away). These same students have never owned a passport. You should have seen the look on their faces when they received their first foreign stamp in the passport…priceless! Our student’s minds were broadened with a whole new global perspective. They learned a beautiful Central American culture and they really enjoyed being a part of it. They even adopted the national phrase “Pura Vida”. They participated in Zip Lining in a tropical rainforest called Brauilo Carrillo National Park. They soared over 170 feet on top of the canopy of the rainforest. At the end of the zip lining, they experienced a real life tropical rain storm with booming thunder while having lunch in paradise. Talk about awesome! 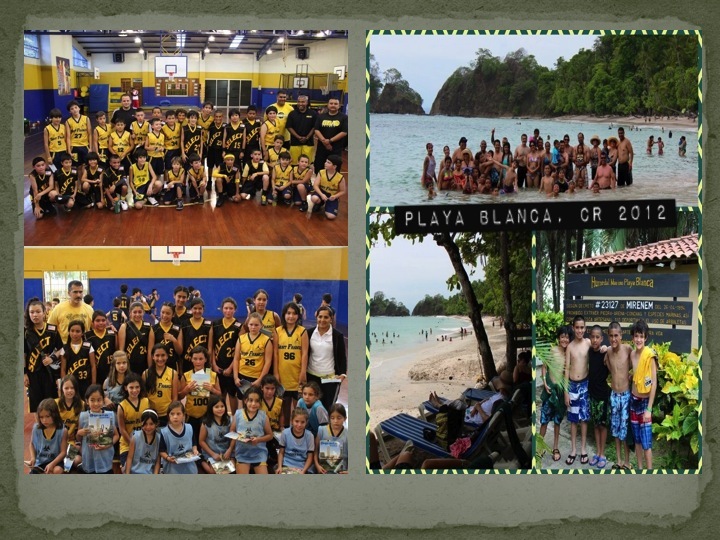 Our students were able to go to spend the weekend at Playa Blanca, a world-renowned beach in Costa Rica. They were also able to swim at the Tabacon hot springs, located at the base of an active volcano called Arenal. Our students also got to go above of another active volcano called Poas. This tourist site allows you to see the immense crater that spews smoke from the volcanic activity. There they learned that Volcano Poas is part of the Pacific Ring Fire Circle and that Costa Rica has over 200 identifiable volcanic formations dating back over 65 million years. Known for exotic wildlife, our students were able to see in person: At Playa Blanca, White-Faced Monkeys that come down from the top of the trees as they ate lunch and Coatimundi (they look like a cross between a raccoon and a weasel); Crocodiles at the bottom of the Corcovado river bank; and indigenous wild life of Central America at La Selva Wildlife Refuge & Zoo. Sport has the ability to teach our youth many important core values in life. This unique experience taught our students how their lives play an important role in a global society and we have no doubt that our students came back with a renewed sense of positive citizenship and leadership within our community. Once again, we thank you all from the bottom of our hearts and look forward to your continued support of the Gil Basketball Academy mission.